In addition to all the feral dogs, chickens, goats, sheep and roadcows on the island, there are also a few donkeys. Unlike the roadcows, which are allowed to wander at will across whatever land they might like, it is rare to see a donkey without a human counterpart. HB and I usually see one of two donkeys. The first is the tourist donkey. It wears a wreath of flowers around its neck and hangs out by the cruise ship dock with a sign offering pictures with the donkey for $5 or some other amount. The second is the bucket donkey. He has two buckets attached to a harness that go across his back, like saddlebags. We often see him in Sea Cow's Bay, or being ridden by his owner. 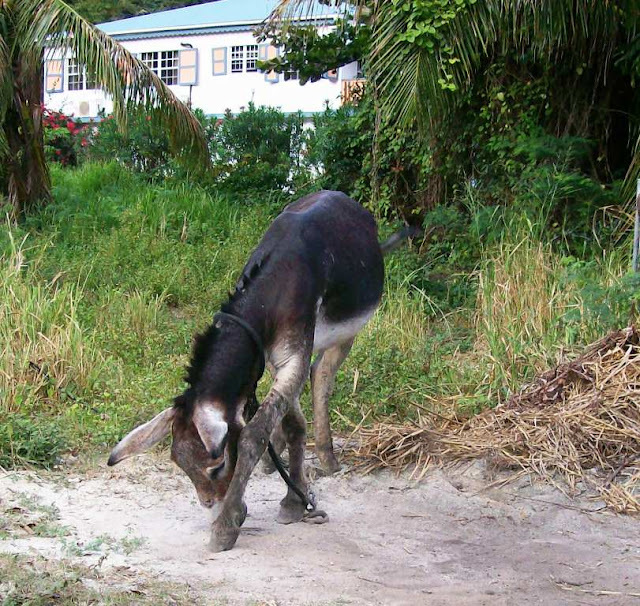 The other day, on my way to work, was the first time I had seen a human-less donkey since arriving on the island. Only feet from the road, he was being awfully cute, kind of snuffling in the sand around his hooves. It wasn't until the clicking of my camera startled him and he ran off into the brush that I noticed the long chain he was pulling behind him, and the anchor in the ground near the road. I just can't get enough of all the not-so-wild-life on Tortola. Gadling | travel blog | news, stories, deals, and tips. All content copyright 2012 AS. Ethereal theme. Theme images by sbayram. Powered by Blogger.